We began at road's end in Glen Feshie. There was no snow, it was warm. We climbed up into the whiteout through the moorland. It wasn't a comment on our post everything culture or a reflection of our mind's eye. It didn't mean anything in particular and our presence was neither here nor there. Over an hour or so we shed our skins and let the mountains take us back. It's always good to be back. Black Grouse startled unwound below, Ptarmigan flapped and croaked in chorus on icy scree slopes. There was little to spy on the summit of Carn Ban Mor, which we achieved with the aid of GPS. We met a pair of dogs enjoying the snow and ate lunch in Dave's bothy bag. We grew very cold and so worked our way down towards the Moine Moor in glorious whiteout. As we felt our way on map and compass, we glimpsed hints of the wider plateau, sloping, rising and falling. We commented that even relatively recently, these conditions would have seemed intimidating, now it was a fun, surreal test of navigation skills, and a finding beauty in the empty. This kind of empty is not an absence, a lack or a nothing, this kind of empty is full to the brim. As we walked across the moor our way grew less abstract. Where the sun cut through, we were able to recognise features - the distant summit of Braeriach, the heavy peaks and troughs sheltering Loch Einich. Many times we stopped in our tracks, either calling out to one another, or just plain stunned into silence. The promised high pressure had come good. Intimacy. Hard to comprehend how grand vastness can be intimate, but the quiet helped, and as the cloud lifted, so the wind died, and it became calm. We headed for the folded limbs of Tom Dubh at the head of Glen Eidart, a place without paths. Certainly there were none in the snow. We kept our descent from the frozen moor soft, close, hushed. A feeling of undiscovered stillness, a secret place in growing shadows. We met no-one else here, here was ours alone this afternoon. As we turned the corner into the head of the glen we were met with bright sunlight and spindrift. We camped opposite the coire, joined only briefly by a yellow mountain rescue helicopter on its rounds. I put on a brew and we sintered our pitch for the night, sharing a shelter and a single set of snow pegs. The position was exposed, so over the course of the evening we cut 2'' windslab tiles from the ground around our shelter and built a circular wall or fank to protect us from the worst. I went to collect water and fell through a small cornice - it was just a few feet, but we melted snow for the rest of our stay. Some whisky was taken, the wall grew higher and higher - both were good ways to keep warm. As so often this winter, the weather window was tiny. 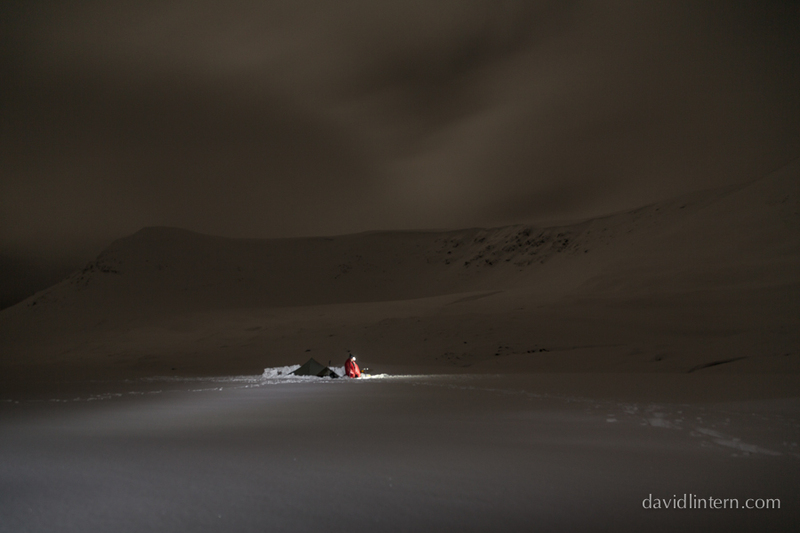 By the time we struck camp the following morning, a new storm was howling up the glen from the south. The walk out to the upper Feshie was foul. Our passage slowed to a little under 1km an hour through heavy spindrift, postholing in breakable crust to knees and sometimes thighs every step. We cursed our lack of skis and the skills to use them, and renamed Eidart a few times - the only one repeatable here is the Glen of Misery. By the time we got to the bridge we were spent. As we neared the end of our slog, deep in the private space of the glen, a fox leapt out from hiding in a heathery crag, bushy and vivid red-brown in his winter coat. A well stationed lair to access the ptarmigans in the upper glen and the grouse down below. My heart softened with wonder and empathy. In concert with the strain of that walk in the storm, it was a singular treat. A rarer sighting than it should be, and a further confirmation not of the power of our imaginations, but of the rude and self willed intimacy of wild places.